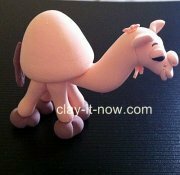 When I was new in clay craft few years ago, I always follow the step-by-step instructions provided by other artist to create figurine with air dry clay. 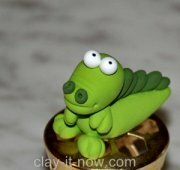 As time goes by, my modeling skill improved and nowadays designing and making my own clay figures of the animals are not a problem at all. 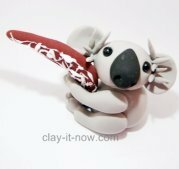 I am happy to share my skill with you so you can design your own figurine too. First of all think about the purpose of your figurine. Is it for hanging ornaments? Cake topper? Wearable items? Stand alone sculpture? Table decoration? Group of figurines? 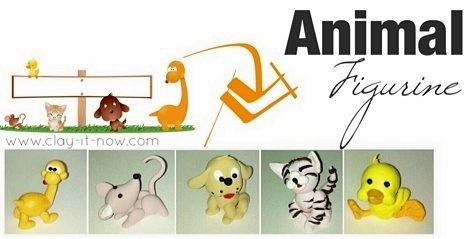 Next, choose the type of animal you want to make with air dry clay. And then choose your color scheme. Would you like to have the color of the figurine close to the actual animal or would you like to have the color matches your overall design? From here, draw a rough sketch of the animal pose, expression and the color you want to create. So are you going to model a lifelike animal with realistic appearance or are you going to model a cartoon style figurine? I like a more caricature appearance because the animal looks adorable this way. You may have decided the type of the animal you are going to create but not sure about its detail. Open your children story books and you may surprise to see there are many good animal pictures inside. Also, hobby magazines, tourist information booklets, postcards and internet are good to find information about animals. After getting the animal picture I like, I would normally make a copy and then scribble on it to find basic geometrical shapes, simplify the shapes, pick up my clay material and start sculpting the animal. 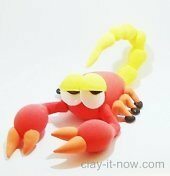 Your figurine will look more attractive and fascinating with expression. You can create the expression by changing its position, changing facial expression or adding props. Different-shaped eyes, eyebrows, noses, mouths and ears can change the character of your figurine. 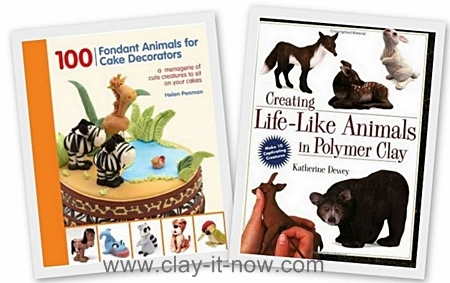 The frog figures are modification of those in Maureen Carlson's Book, Clay Characters for Kids.